Eating foods high in salt is known to contribute to high blood pressure, but does that linear relationship extend to increased risk of cardiovascular disease and death? While recent studies have contested that relationship, a new study confirms it. The study - published in theInternational Journal of Epidemiologyby investigators from Brigham and Women's Hospital and their colleagues using multiple measurements - suggests that an inaccurate way of estimating sodium intake may help account for the paradoxical findings of others. "Sodium is notoriously hard to measure," says Nancy Cook, ScD, a biostatistician in the Department of Medicine at BWH. "Sodium is hidden and you often don't know how much of it you're eating, which makes it hard to estimate how much a person has consumed from a dietary questionnaire. Sodium excretions are the best measure, but there are many ways of collecting those. In our work, we used multiple measures to get a more accurate picture." The team assessed sodium intake in multiple ways, including estimates based on that formula as well as ones based on the gold-standard method, which uses the average of multiple, non-consecutive urine samples. They assessed results for participants in the Trials of Hypertension Prevention, which included nearly 3,000 individuals with pre-hypertension. The gold-standard method showed a direct linear relationship between increased sodium intake and increased risk of death. The team found that the Kawasaki formula suggested a J-shaped curve, which would imply that both low levels and high levels of sodium consumption were associated with increased mortality. "Our findings indicate that inaccurate measurement of sodium intake could be an important contributor to the paradoxical J-shaped findings reported in some cohort studies, the authors stated. Epidemiological studies should not associate health outcomes with unreliable estimates of sodium intake." Does Nutritional Labeling For Sodium Work? Ninety percent of Americans eat more than the recommended amount of sodium per day. Foods popular in the American diet that are saturated with sodium include frozen pizza, potato chips and fast food hamburgers. New research from the University of Georgia has determined that one popular approach - nutrition labeling - doesnt work. Currently we dont know which interventions are most effective to reduce sodium intake in the U.S. population, and the Nutrition Labeling and Education Act is the only policy in the U.S. focusing on informing consumers about sodium content on most packaged foods, said Donglan Stacy Zhang, assistant professor of health policy and management at UGAs College of Public Health and lead author on the study. Nutrition labels are designed to help consumers make the best food choices for their health, which is why calories, fats and other major nutrients like protein, fiber, and vitamins and minerals are prominently featured. In a paper published in theAmerican Journal of Preventive Medicine, Zhang and her co-authors examined the link between regularly reading nutrition labels and consumption of high-sodium foods. Using two consumer behavior data sets from the National Health and Nutrition Examination Survey, the researchers compared how frequently participants used nutrition labels and their daily sodium intake. They found a small effect. Frequent nutrition label users consumed 92 milligrams less sodium per day than infrequent nutrition label users, but label readers were still eating around 3,300 milligrams of sodium, well over the Food and Drug Administrations recommended upper limit of 2,300 milligrams per day. Thats a very small reduction, said Zhang. Without health promotion, without any other additional education intervention, nutrition labeling has little impact on sodium consumption. There is a need for better label design. The current label can present challenges to some consumers with limited education or non-English speakers. Visual or color-coded designs, like the traffic light model used on food packaging in the United Kingdom can overcome low literacy. We need more research in this area, how to better design the label and how to best get this information to consumers to guide their decision-making, Zhang said. The effect varied widely across age, gender and socioeconomic groups. Specifically, low income consumers were less likely to use nutrition labels. We suspect that low-income people are more concerned about other variables such as food prices or convenience, she said. Those other competing variables may be more important to them than nutrition values in their food products. Interventions that increase nutritious food choices for low-income consumers may be a more successful way to reduce sodium intake in these groups. Can A Healthy Diet Offset High Salt Intake? A healthy diet may not offset the effects of a high salt intake on blood pressure, suggests a recent study. The research, from scientists at a number of institutions, including Imperial College London and Northwestern University, analyzed the diets of over 4,000 people. The results, published in the journalHypertension, showed that people eating higher amounts of salt had higher blood pressure no matter how healthy a person's overall diet. High blood pressure affects more than one in four adults in the United Kingdom, and increases the risk of a number of conditions including heart attacks and stroke. It's thought to have a number of causes, including age, weight and eating too much salt. Vitamins and minerals in fruit and vegetables might in some way affect blood vessels, enabling them to lower blood pressure. Previously, experts believed that eating high amounts of fruit and vegetables might help counteract the effect of high salt on blood pressure. However, while these foods do tend to lower blood pressure, the new research suggests they do not counteract the adverse influence of salt intake. The team studied data from the INTERMAP study. In this study, which was conducted between 1997 and 1999, scientists tracked the diets of 4,680 people, aged 40 to 59, from the U.S., UK, Japan and China. The volunteers were tracked over four days, and two urine samples were taken. Measurements of height, weight and blood pressure were also taken. The team assessed concentrations of sodium and potassium in the urine samples. Sodium is the main component of salt, while potassium, which is found in green leafy vegetables, has been linked to lower blood pressure. The team also used dietary data to assess the volunteers' intake of over 80 nutrients that may be linked to low blood pressure, including vitamin C, fiber, and omega-3 fatty acids. Many of these nutrients are found in fruit, vegetables and whole grains. The researchers found a correlation between high blood pressure and higher salt intake, even in people who were eating a high amount of potassium and other nutrients. The researchers estimated salt intake by analyzing sodium in the urine, as well as analyzing dietary data. The recommended upper limit of adult salt intake in the UK is six grams a day or one teaspoon. The study found that average salt intake across the study was 10.7 grams a day. The average intake for the UK was 8.5 grams, while the intake for the U.S., China and Japan were 9.6 grams, 13.4 grams and 11.7 grams respectively. Increasing salt intake above this average amount was linked to an increase in blood pressure. An increase of an additional seven grams of salt above the average intake was associated with an increase in systolic blood pressure of 3.7 mmHg. Blood pressure is measured in two numbers. The first, called systolic pressure, measures the force the heart pumps blood around the body. The second number, called diastolic pressure, is the resistance to blood flow in the arteries. Ideally, blood pressure should be between 90/60 and 120/80 mmHg. However, reducing blood pressure by just a small amount can reduce the risk of conditions such as stroke. The research shows the importance of cutting salt intake. "We currently have a global epidemic of high salt intake and high blood pressure, says Dr. Queenie Chan, joint lead author of the research from the School of Public Health at Imperial. This research shows there are no cheats when it comes to reducing blood pressure. Having a low salt diet is key even if your diet is otherwise healthy and balanced. As a large amount of the salt in our diet comes from processed food, we are urging food manufacturers to take steps to reduce salt in their products." Seventy-three percent of Canadian breads exceeded Health Canada's 2016 targets for sodium in bread products and 21 percent were above recommended maximum levels. The saltiest bread in the survey was Rosemary Foccacia by ACE Bakery, which is available in Canada. It contained 2.65 grams of salt (1060mg sodium) per 100 grams, which is saltier than seawater. In Canadians more than one year of age, bread contributes the most sodium to dietary intakes - 14 percent - primarily because it is consumed in large quantities. Reducing salt in bread is an easy and effective way of lowering salt intake across the whole population. Research has shown that the salt content of bread could be lowered by 25 percent over six weeks and consumers would not notice the difference. More than 40 percent of white breads included in the WASH survey had more salt than the UK's maximum salt target. The Republic of Macedonia produced white breads with the highest salt content, averaging 1.42g/100 grams, compared to China which had the lowest average salt content of 0.65g/100 grams. Canadian breads in this category had an average salt content of 1.23g/100 grams, ranging from 0.43g/100 grams to 2.65g/100 grams. Despite the UK's progress with salt reduction to date, the average salt content of wholemeal breads from Qatar, China, Costa Rica and South Africa were lower than the average salt content of wholemeal breads in the UK. This suggests that mandatory salt reduction targets, such as those put in place in South Africa, may be more effective than voluntary targets. Although mixed grain breads had the lowest salt content of the bread categories, there was still a huge variation within this category. The highest salt bread available in Bulgaria had a salt content of 2.50g/100g, compared to the lowest salt bread available in Costa Rica with a salt content of 0.09g/100g. In Canada, the highest salt bread in this category had a salt content of 1.69 g/100g and the lowest 0.46 g/100g. A recent survey by WASH found that a third of respondents felt that the World Health Organization could do more to encourage countries to lower salt intakes. However, the majority of respondents felt that their country's government should take primary responsibility. "Although recent Health Canada data has documented some progress in the reduction of sodium in prepackaged foods, Canadian bread products surveyed here demonstrate that more work is needed to meet recommended levels," says Professor Mary L'Abbe at the University of Toronto. "This survey clearly demonstrates the progress still to be made to lower salt intake by 30 percent by 2025, in line with WHO recommendations, added Mhairi Brown, Nutritionist at WASH. Bread is an essential staple food in many countries but is still a key source of salt in our diets due to the frequency with which we eat bread. Globally we must do more to reduce salt intake, and a simple way to do this is to lower salt in our staple foods." "Eating too much salt puts up our blood pressure, the major cause of strokes, heart attacks and heart failure, the leading cause of death and disability worldwide, added Graham MacGregor, Professor of Cardiology at Queen Mary, University of London, and WASH Chairman. Reducing salt intake around the world would save millions of lives each year and all countries should be working towards reducing salt intake by 30 percent by 2025. Our survey has shown that many bread manufacturers internationally are still adding huge and unnecessary amounts of salt to their products. Governments must act now and reinvigorate salt reduction work in the food industry." Sodium intake also continues to be a major issue for many Americans. While the American Heart Association recommends an ideal limit of no more than 1,500 milligrams per day for most adults, recent findings showed that from 2013 to 2014 the average daily U.S. sodium intake was 3,409 milligrams excluding salt added at the table. These findings from the Morbidity and Mortality Weekly Report by the Centers for Disease Control and Prevention showed breads were the top source, comprising six percent of sodium consumed. This was followed by pizza, sandwiches, cold cuts and cured meats, soup, and rice. The most important thing consumers can do to ensure they are not overdoing on salt is to check food labels. The AHA recommends no more than 2,300 milligrams a day, andan ideal limit of 1,500 milligrams for most adults. Most items you buy at the grocery have a food label that will tell you exactly how much sodium is in that product, says Anna Threadcraft, RDN, and Director of Employee Wellness at the University of Alabama at Birmingham. The recommended daily sodium intake is 2300 milligrams or less, which may seem like a lot, but thats really the equivalent of a teaspoon. It is very easy to overconsume without realizing it. Most Americans consume their recommended sodium intake already through the foods they eat day to day, and when people add more salt for flavor, that pushes them over the limit. Because the average Americans sodium intake is so excessive, even cutting back to no more than 2,400 milligrams a day will significantly improve blood pressure and heart health. I encourage people to taste their food before salting to see if food actually needs it to ensure theyre not salting simply out of habit, she said. Americans get most of their daily sodium - more than 75 percent - from processed and restaurant foods. Sodium is already in processed and restaurant foods when purchased, which makes it difficult to reduce daily sodium intake. I think the first and most important thing people can do is to read the labels on the products they buy, Threadcraft continued. Pre-packaged foods definitely have their place, but they should be chosen carefully. The first thing to do when looking at labels is to identify the serving size, then look at the milligrams of sodium which are connected with the serving size listed. A lot of people who have busy schedules need something quick and pre-prepared to eat, she said. That doesnt mean you have to give up flavor in order to get something healthy that is also easy to make. Frozen vegetables are a great option for a quick and low-sodium side at dinner, and typically there is no sodium added. When using canned vegetables, look for low-sodium or sodium-free options since many canned food items are high in sodium. Rinsing canned items is another way to reduce the sodium content. Americans eat at fast food or dine-in restaurants four or five times a week. For those who frequent restaurants, most establishments have their nutrition facts listed either online or in the store. Consumers should also be aware of hidden sources of sodium such as sauces and dressings, and ask for these toppings on the side. One tablespoon of teriyaki sauce can have 879 milligrams of sodium. The same amount of soy sauce may have up to 1,005 milligrams - almost half of the recommended daily intake. Try using pure herbs and spices instead of extra salt to find the perfect flavor. There is no salt in pure herbs and spices at all, and you can get a very rich flavor from those, Threadcraft said. Acidic juices like orange or pineapple are great marinade alternatives for chicken or fish compared to barbecue sauce or soy sauce. To get the most flavor from herbs, crush or rub them before adding them to the dish. Buy herbs and spices in small amounts as you need them rather than storing them for a long time. If using fresh herbs such as parsley or cilantro, store them in water so they stay fresh. Most Americans eat three meals a day, and depending on diets, breakfast may be the biggest culprit when it comes to sodium intake. In the South, we love our salt, Threadcraft said. Breakfast casseroles, sausage and bacon are major sources of sodium. While watching sodium intake can be tedious, all foods can fit. If you really love bacon, which is high in sodium, then maybe you can make a wise choice and not add salt to your eggs at breakfast. You can find ways to compromise, but be smart with it. Excess sodium can increase yourblood pressureand your risk for aheart diseaseandstroke, Threadcraft continued. Together, heart disease and stroke kill more Americans each year than any other cause. But salt does not just increase risk of stroke and heart disease. UAB researchers David and Jennifer Pollock, Ph.D., arestudying the effectsof salt on the renal system. We know that the Western diet we all eat has far too much salt in it, and we know the number of people consuming salt in Western and developing countries is rising, David Pollock said. Evolutionarily speaking, we didnt have bountiful salt in the diet until just in the last 100 years. But physiologically, we are designed to conserve salt. We havent evolved to handle these high-salt diets were eating. 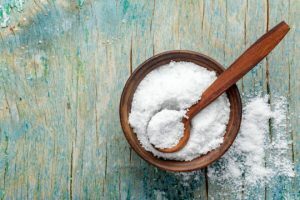 Now that its become appreciated that a high-salt diet may contribute to the rise of many diverse health problems including autoimmune disease, trying to understand how the body regulates salt is extremely important. Salt helps to maintain the bodys fluid balance and maintain muscle contraction and is a vital component of blood, plasma and digestive secretions. Salt is not inherently bad, but people need to learn to manage it effectively.